We train our students to the best of their ability. Some students come to us in shape, while other have come to us 100 pounds overweight. Most come to us with limited flexibility. Adults start at any age, as we have had some adults who started as late as age 65, and have still earned their black belts. As a student, you are looked upon as an individual, never compared to anyone else. Our instructor will be there every step of the way. All that is expected of you is a willingness to try. Once you've aquired a strong foundation in the basics, our program will enhance your physical capabilities and maximize you self defense skills. You will understand exactly what it takes, mentally and physically, to defend yourself and your loved ones should the need ever arise. We are interested in the complete personal development of each student. 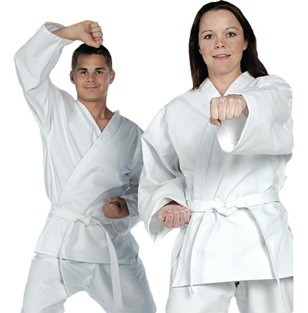 • Fitness - The principals of Taekwondo techniques are based on the design of your body. For power you develop the larger, powerful muscles of the torso. The speed of the techniques comes from the fast, agile muscles of the arms and legs. As you progress in Taekwondo you will learn to coordinate this speed and power, and develop a concentration to focus all of your body's strength into a small, hard striking surface like the edge of the hand or the heel of the foot. • Self-defense - When the speed and power develop through Taekwondo is used in a self-defense situation against the soft vulnerable parts of an attacker's body, the result can be incredible. Taekwondo allows a woman to emphasize many of her natural physical strengths, such as power in the legs, while learning a method of self-defense efficient against a much larger opponent. Knowing you can defend yourself, your confidence will grow. And confidence alone is usually enough to deter potential attackers. • Self-confidence - This does not come naturally for many people, but self-confidence can be developed over a period of time. Through Taekwondo, as you accomplish new goals, your confidence level increases. Taekwondo instills a sense of discipline and self-confidence that can carry over to all aspects of your life.